PRESENTING: The Arkansas Razorbacks, aka "The Diamond Hogs". To say Arky is good would be a gross understatement. Arkansas is solid, top to bottom, lineup-wise, program-wise, tradition-wise. The Hogs have been to Omaha 6 times (including last year), made regionals 20 times, and have been to Hoover 8 straight times. Arkansas has success, they have talent, and they are sitting at the top of the SEC. Baum Stadium is the palace of college baseball stadiums. Though many schools now are building new stadiums, they still are playing catch up with the Razorbacks. 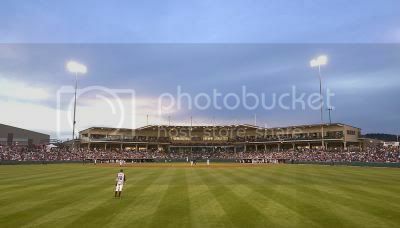 When Baum Stadium was erected in 1996, it was the class of college baseball. Not much has changed, as the capacity currently is 10,500 and luxury suites extend from the left-field foul pole to the right-field foul pole. Arkansas fans also pack the house rain or shine and provide a premier home-field advantage for their baseball program. Everyone aspires to have a facility like the University of Arkansas. This year, the Hogs have an impressive 25-3 record at home (Ball State, South Dakota State, Kentucky). Outside of those head-scratchers to Ball U and SDSU, Arky has been tough to beat at home. 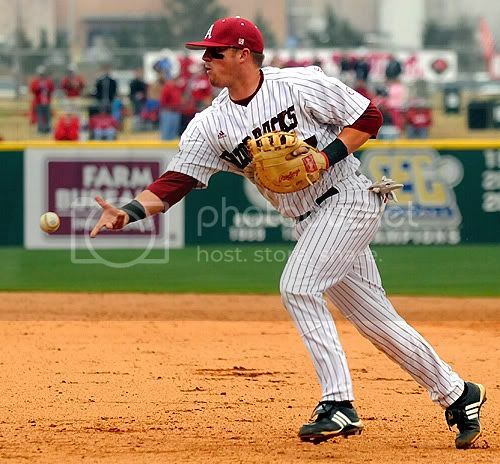 "Not a whole lot of people know about Arkansas baseball," junior first baseman Andy Wilkins said. "Even when I was getting recruited, I didn't know Arkansas had a baseball team. But I came over here, and it was like a palace. Even schools in Oklahoma don't know how nice this place is. "It's just a great atmosphere to play in. We have great fans, and we're finally starting to put Arkansas back on the map." In the bottom of the ninth, Brian Johnson picked up a one-out single for the Gators. Matt den Dekker followed with a base hit to left to give the home team runners on first and second. Mike Zunino delivered with a bloop single that fell in shallow right. On the play at the plate, Johnson was called safe to give Florida the victory. Now the picture below has been circulating all week. Arkansas fans will tell you that it CLEARLY shows the Florida player getting tagged out on the winning run. However, if you look at the video here (which is frustratingly NOT embedable) it looks like the Catcher missed the first tag and that photo is the 2nd tag. 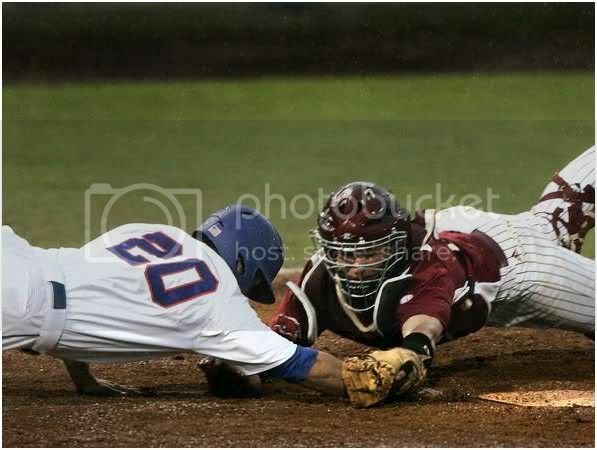 The Florida runner was called safe after the first tag. 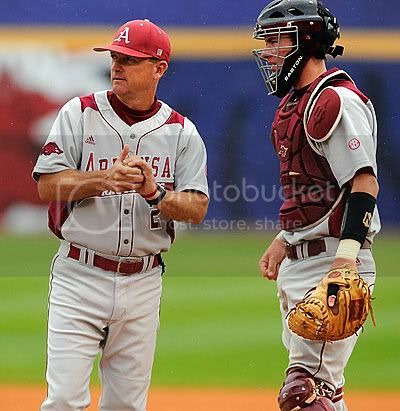 Last year, Arkansas swept Auburn at Plainsman Park (3-2, 10-6, 12-6) but in 2008, the Tigers took 2 of 3 from the Hogs (5-2 W, 4-5 L, 12-10 W) highlighted by a strong performance by Grant Dayton, who went 6 ip/5h/2er/6k to pick up the win as a Freshman. It was Auburn's first Friday night win in Fayetteville since 2000. This year, Dayton will again get the nod (although it will be on Sunday and not Friday. Cory Luckie will take the ball Friday and TBA is slotted for Saturday). OPP IP HITS ER K Dec? OPP IP H ER K DEC? Smyly (above) is the Hogs Ace and throws a peppy fastball and a work-in-progress changeup. He's a perfect 6-0 on the year in 8 starts and seems to be getting better and better as the season progresses. 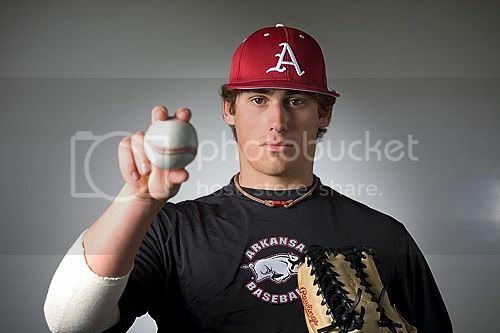 He's already a bit of a legend in Arkansas after pitching 8.1 innings of no-hit baseball (with 12 ks) in Arkansas's 2009 Regional Clinching win over Oklahoma. He's currently #7 in Rivals.com Power Rankings for Pitcher. He had a solid freshman season in 2008 which saw him hit .298 with eight homers and a team high 48 RBI. He also saw time on the mound as he made 11 appearances including three starts while going 3-1 with a 4.50 ERA in 24 innings of work. He spent the summer of 2008 in the Cape Cod Baseball League with the Wareham Gatemen where he picked up .214 average while hitting four homers and driving in 18 runs. 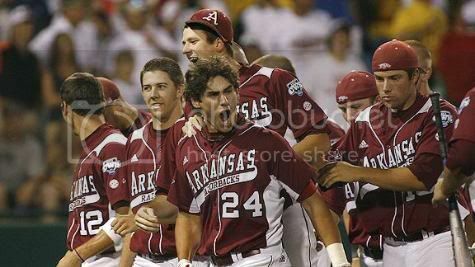 Eibner appeared in 45 games including 42 games in 2009 as he hit .231 with 12 homers and 34 RBI. He also pitched in 17 games (all starts) with a 5-5 record and a 5.00 ERA. He appeared in 20 games in the Cape Cod Baseball League with the Wareham Gatemen where he hit .240 with three homers and seven RBI. He also saw some time on the mound as he went 1-0 in three starts and an ERA of 2.19 before injuries sent him home early from the Cape. We believe that Eibner will eventually play up to his potential which he showed in high school where he was selected in the fourth round by the Houston Astros. Cox had a solid freshman season with the Razorbacks as he hit .266 while finishing second on the team with 13 homers and 39 RBI. He also appeared on the mound in 14 games going 5-1 with a 4.82 ERA. He played the summer of 2009 in the Cape Cod Baseball League with the Cotuit Kettleers. He led them with a .344 batting average while driving in 11 runs. He was named to the CCBL All-Star game where he won the MVP award after going 2-2 with two RBI. He was also named to the All-League team. Baseball America rated him as the number 2 prospect in the CCBL. Those two guys by themselves would be enough to power any team. 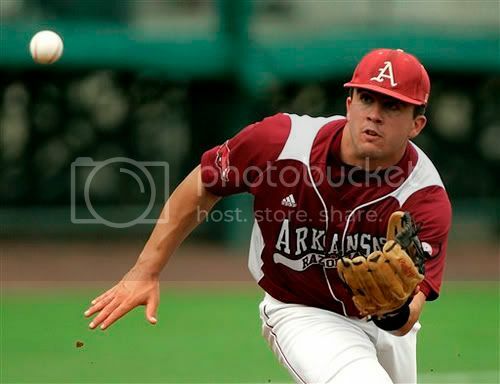 However, Arkansas also has JR 1B Andy Wilkins, whose 52 RBI leads the team (and who was #77 in the top 100) and OF Collin Kuhn (#6 in the Rivals OF Power Rankings). Kuhn is a perfect 15 for 15 on stolen bases, 6th in the SEC in batting average, 1st in Runs, 5 in hits, and 4th in slugging %. Arkansas has also struck out an SEC Low 229 times (Auburn in comparison has whiffed 299 times) and Grounded Into an SEC low 12 Double Plays (AU? 25). So you have a patient team that makes solid contact. A tall order to be sure for an Auburn pitching staff that is searching for Starter and a bullpen that looked iffy most of the UK series. At least with LSU there were holes in their lineup that Auburn could (and did) exploit. With Arkansas, those aren't there. The majority of the Arkansas lineup is hitting over .300 and they are disciplined and probably a little pissed off from dropping the Florida series. 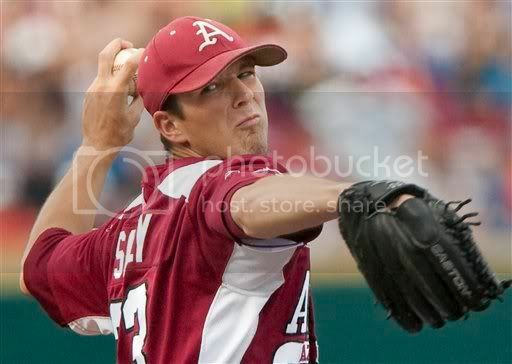 If anything works in Auburn's favor its that outside of Smyly, Arkansas is hittable. 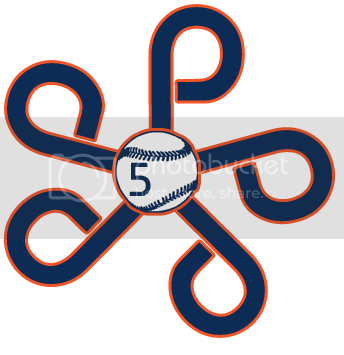 However, Auburn will have to take full advantage of any base runner it can get on and manufacture runs. Lucky for the TIgers, Arkansas does have some fielding issues and C James McCann has had 44 steal attempts and 35 stolen bases against. He's only caught 8 runners all season. To put it bluntly, Auburn will need all the help it can get this weekend. Baum is imposing, Auburn has been iffy on the road (outside of the UGA series) and Arkansas could feast on Auburn pitching if its not at the top of its game. I'd like to disagree with your worst case scenario. Wouldn't worse case be for Auburn to get swept and Tennessee to sweep Kentucky. We still have to earn the head to head advantage over Tennessee. Also, Tennessee plays UGA next weekend while UK still has LSU and USC up coming. Tennessee seems more dangerous. I think it would be a toss up over which is worse (UK sweep or UT sweep). However, I think it boils down to which is more likely. If UT sweeps they would still need to (ultimately) win 2 of 3 in Plainsman Park. Which I find unlikely.